Can Apple Stay on Top in Today’s Competitive Market? Since the launch of the first iPhone in 2007, Apple has led the mobile technology market. Apple stocks, however, dropped to the lowest point in 11 months after the company cut supply orders for this quarter. 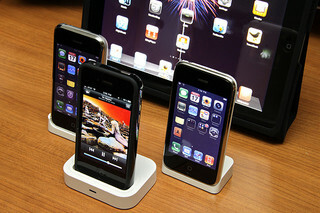 Increased competition is one likely cause of the iPhone 5’s less-than-forecasted demand, but there are several other speculations. The real question is, how will Apple respond to the situation? Is Apple Losing Market Share? Some analysts believe that Apple’s order cuts are typical of any product manufacturer after a strong holiday season. Apple may have over-ordered components last quarter, anticipating shortages from suppliers, and now have an overstock. A Citigroup report in December stated, “It is unlikely that Apple is cutting orders in a ‘great’ demand environment,” suggesting that “good not great demand is likely a factor behind the order cuts.” Whatever the reason for Apple’s supply chain cuts, the tech giant is losing their share in the global smartphone market. Is a Supply Chain Overhaul in Apple’s Future? “As we go from $500 smartphones to even as low, for some companies, as $100 for a smartphone, you’ve got to dramatically rethink the supply chain and how you can make these products and do it profitably,” Sculley stated. The former CEO believes the iPhone’s high-end price tag will be an obstacle in emerging markets, particularly in areas where carrier subsidy programs don’t exist like Brazil and Russia. Cheap iPhone rumors and talk of an iPhone Mini support Sculley’s opinion. Senior global marketing vice president, Phil Schiller has opposing views, however. “Despite the popularity of cheap smartphones, this will never be the future of Apple’s products. In fact, although Apple’s market share of smartphones is just about 20 percent, we own the 75 percent of the profit,” he said. CEO Tim Cook has made sound supply chain decisions in the past and most analysts are confident he will look out for Apple’s best interests.